Ross Hannah became the first Chester player to score a hat-trick in almost two years as Steve Burr's side recorded their best win of the season against struggling Torquay. Hannah got his first in just 15 seconds after being set up by Danny Hattersley. Ryan Higgins cut in to fire home a left-foot shot for the second before Hannah's free-kick made it 3-0. On-loan Andre Wright pulled one back, before Jonny Hunt set up Hannah for his third. The last Chester player to hit a hat-trick was on-loan Matty Taylor in a 4-3 Conference win at Tamworth in February 2014. Ross Hannah's opener is understood to be the fastest ever goal scored by a Chester player. In-form Hannah now has 12 goals for the season, nine of which have come in City's last eight games. He could have had more, but hit the post minutes after his opener, had one disallowed and was thwarted on more than one occasion by Gulls keeper Dan Lavercombe. Chester also missed a late penalty when Craig Mahon was pulled down, but John Rooney had his penalty saved, then hit the post with the rebound - and fellow substitute Craig Hobson also hit the woodwork with a header. Torquay slipped to 23rd in the National League, just three points above bottom club Kidderminster Harriers, while Chester climb a place to 14th. Match ends, Chester FC 4, Torquay United 1. Second Half ends, Chester FC 4, Torquay United 1. Attempt missed. Andre Wright (Torquay United) header from the right side of the box misses to the left. Assisted by Louis Briscoe. Danny Hattersley (Chester FC) hits the woodwork with a header from the left side of the six yard box. John Rooney (Chester FC) hits the woodwork with a right footed shot from the right side of the box. Penalty Chester FC. Craig Mahon draws a foul in the penalty area. Attempt missed. Ben Gerring (Torquay United) header from outside the box misses to the right. Attempt missed. Danny Hattersley (Chester FC) header from the left side of the box misses to the left. Substitution, Torquay United. Sam Chaney replaces Kevin Nicholson. Attempt missed. Louis Briscoe (Torquay United) right footed shot from outside the box misses to the left. Attempt saved. Danny Hattersley (Chester FC) right footed shot from outside the box is saved. Goal! Chester FC 4, Torquay United 1. Ross Hannah (Chester FC) left footed shot from outside the box to the top left corner. Assisted by Johnny Hunt. Goal! 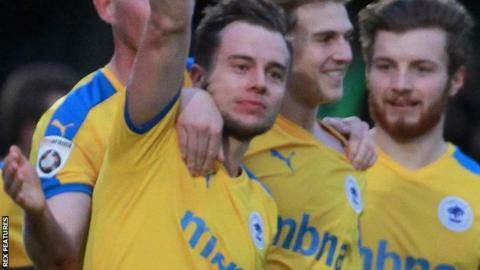 Chester FC 3, Torquay United 1. Andre Wright (Torquay United) left footed shot from long range on the left to the top right corner. Substitution, Torquay United. Ben Gerring replaces Alex Fisher. Attempt missed. Josh Carmichael (Torquay United) right footed shot from outside the box misses to the left. Attempt missed. Ryan Lloyd (Chester FC) header from the left side of the box misses to the left. Attempt missed. Louis Briscoe (Torquay United) right footed shot from outside the box is too high. Foul by Johnny Hunt (Chester FC). Attempt saved. Ross Hannah (Chester FC) left footed shot from long range on the left is saved.